One of the most exciting things about Twitter is that you have the ability to live blog so easily. Twitter really soared in popularity when people started blogging major news stories in real time. Using Twitter to live blog has been used my media and just everyday people to cover all sorts of exciting events. My whole life is just a series of exciting events after another so this tool is very useful for me to bring you, the fan, into my wild and crazy life… Why just last week I brought you a live blog of Fast & Furious, just 7 days after it came out! 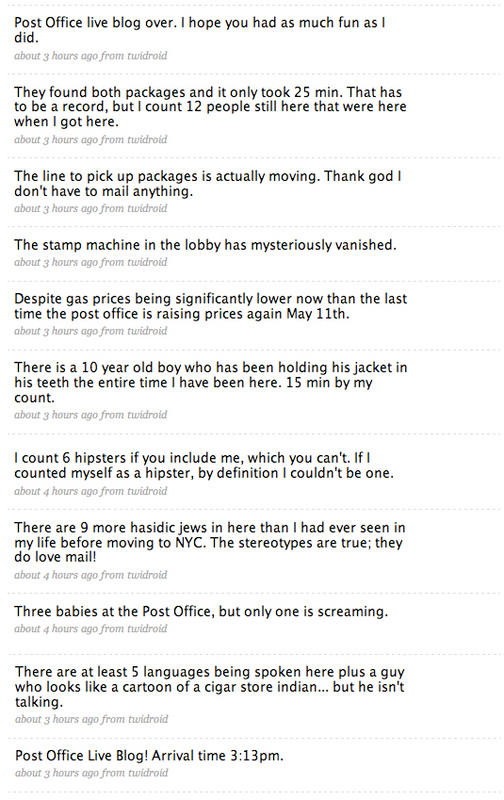 And today I took live blogging one step further… I live blogged from the post office!! In case you somehow missed my exciting (and slightly xenophobic) adventures live, I am posting the full transcript for your amusement and education below. Remember to read it from bottom to top… You don’t want to ruin the surprise twist ending…. Get excited!